The Greens Plus Energy Bar delivers low-glycemic carbohydrates, protein and essential fatty acids that supplies a steady stream of energy throughout the day. Perfect for anyone in need of optimum energy, superior well being, and peak performance. We've combined organically grown superfoods, soy protein, high energy herbal extracts and a little bit of honey to produce the only cold-processed, alkaline-forming green food bar. The Greens Plus Energy Bar contains no processed sugar, salt, corn syrup, hydrogenated oil, synthetic sweeteners, preservatives, or genetically modified foods of any kind. Eat one bar as a healthy snack between meals, or two bars for a complete meal replacement. For best results, chase with 8oz of pure water. Store in a cool dry place or refrigerate for extended shelf life. Ingredients: Organic dates, organic almond butter, organic dark chocolate (organic evaporated cane syrup, organic cocoa liquor, organic cocoa butter, organic vanilla, sunflower lecithin) organic honey, gmo-free soy protein isolate, Original Greens Plus powder (gmo-free soy lecithin, Hawaiian Spirulina, AppleBoost peel and fiber, organic barley grass, organic wheat grass, Japanese chlorella, hydroponic soy sprouts, brown rice bran, sprouted barley malt, organic alfalfa grass, royal jelly, Montana bee pollen, acerola berry juice, natural vitamin E, licorice root, milk thistle seed extract, echinacea root extract, Siberian eleuthero root extract, astragalus root extract, licorice root extract, organic red beet juice, dunaliella salina algae, organic Nova Scotia Dulse, ginkgo biloba leaf extract, Japanese green tea extract, grape seed and skin extract, European bilberry extract), organic brown rice crisps (organic brown rice, organic brown rice syrup, sea salt), organic quinoa sprout powder, natural mixed tocopherols (Vitamin E). Allergy Information: This product contains Almonds, Soy and Wheat and is manufactured in a facility that processes Peanuts, Tree Nuts, Milk and Egg ingredients. May also contain Date pits. The Greens Plus Energy Bar is Gluten-free. Chocolate Coating Ingredients: Barley malt-sweetened chocolate, cocoa butter, GMO-free soy lecithin, vanilla extract. Allergy Information: This product contains Almonds, Soy and Wheat and is manufactured in a facility that processes Peanuts, Tree Nuts, Milk and Egg ingredients. May also contain Date pits. 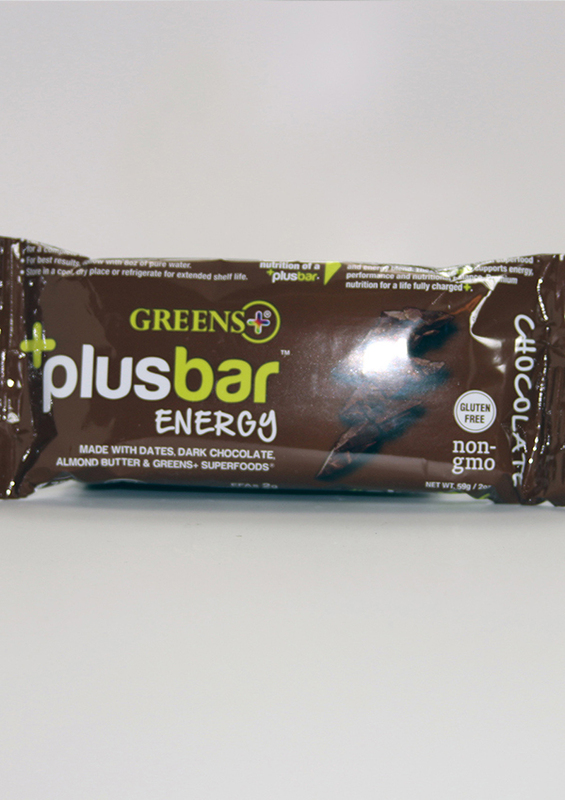 The Greens Plus Energy Bar is Gluten-free.